9:30 AM – The participants and the guests will take their seats. 9:45 AM – Flag Hoisting & Welcome address by the President, RWA. 10:00 AM – Cultural Performance of children/ participants for patriotic songs, dance etc. 11:00 AM – Sports activities for children and residents. 12:30 PM – Distribution of prizes to the winners in sports activities. 01:00 PM – Followed by Lunch for all residents at the venue. Residents/children who wish to participate in cultural/sports activities are requested to register their names at RWA office latest by 25.01.2019. All residents are cordially invited to participate and celebrate the Republic Day at central park of our society. This is to inform you that tomorrow (Thursday) 24/1/2019 all lifts will remain close from 10 AM to 5PM due to maintenance of Generator. Residents of Sanskriti Apartments are requested to co-operate with us. Inconvenience cause to the members during this period is regretted. This is noticed that some notorious people or group of people are damaging and making scratches on the vehicles in the society. This is humble request to all the residents to keep their eye and ear open towards such nuisance creators. Kindly be vigilant and inform the security personels whenever you are on vacation or on long travel and your house is locked so that security personells can be more vigilant and careful. Below you can find the screenshot from the society notice board. We proudly inform you that international yoga day is being celebrated on 21st June 2015 worldwide. 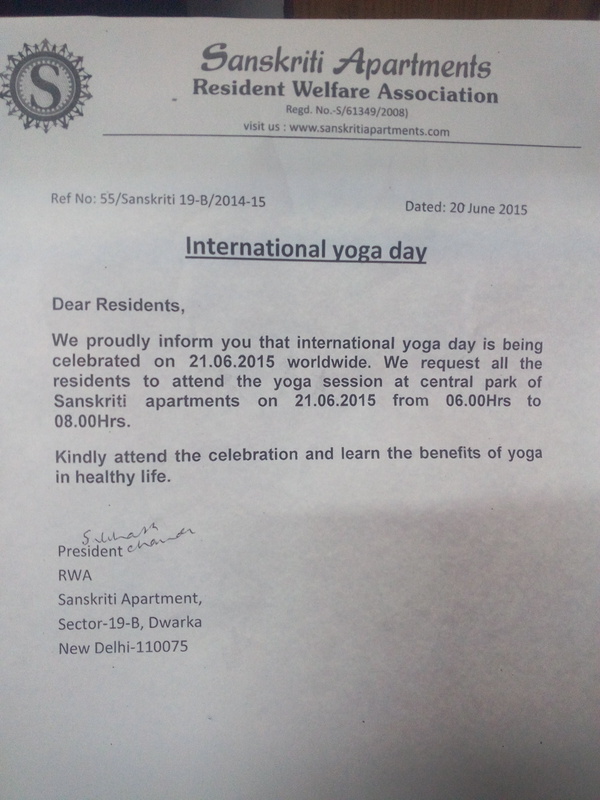 We request all the residents to attend the yoga session at central park of Sanskriti Apartments on 21st june 2015 from 06.00 Hrs to 08.00 Hrs. Kindly attend the celebration and learn the benefits of Yoga in healthy life. Below is the screenshot from the society notice board. 1. 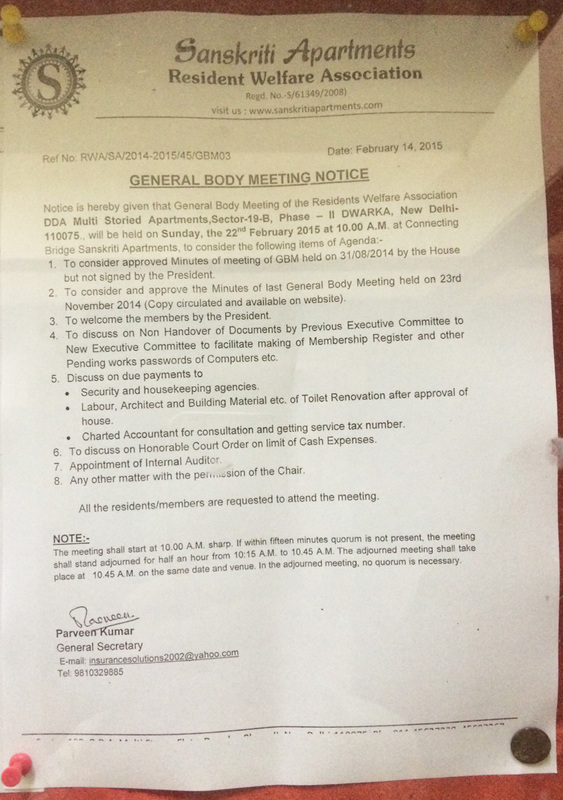 To consider approved Minutes of meeting of GBM held on 31/08/2014 by the House but not signed by the President. 2. 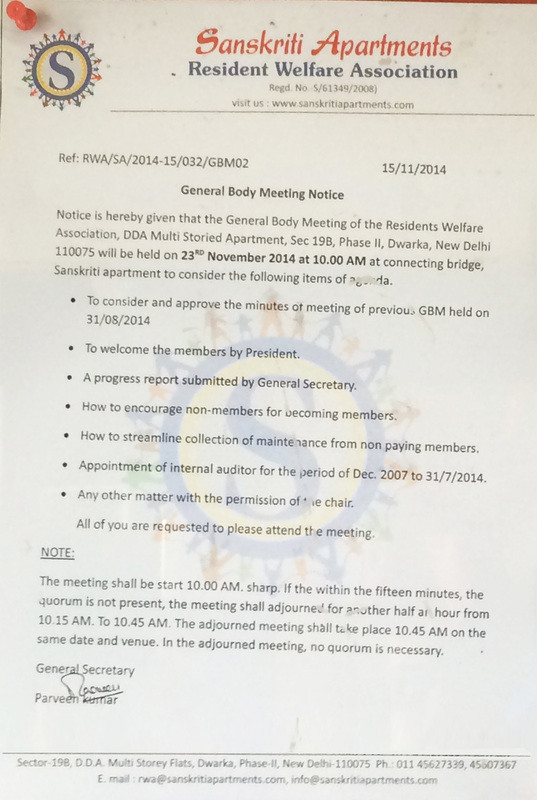 To consider and approve the Minutes of last General Body Meeting held on 23rd November 2014 (copy is already circulated and available on website at http://www.sanskritiapartments.com/mom-gbm-23112014/). 3. To welcome the members by the President. 4. To discuss the Non Handover of Documents by previous Executive Committee to new Executive Committee to facilitate making of Membership Register and other pending works like password of computers etc. Labour, Architect nd Building Material etc of Toilet Renovation after approval of House. Charted Accountant for consultation and getting service tax number. 6. To discuss on Honorable Court Order on limit of Cash Expenses. 7. Appointment of Internal Auditor. All the residents are requested to attend the meeting. The meeting shall start at 10:00 AM sharp. If within fifteen minutes, quorum is not present, the meeting shall stand adjourned for half an hour from 10:15 AM to 10:45 AM. The adjourned meeting shall take place at 10:45 AM on the same date and venue. In the adjourned meeting, no quorum is necessary. Resident Welfare Association would like to inform you that a new scrap dealer, Mr. Mahesh Chand has been appointed in place of old scrap dealer Mr. Subhash. 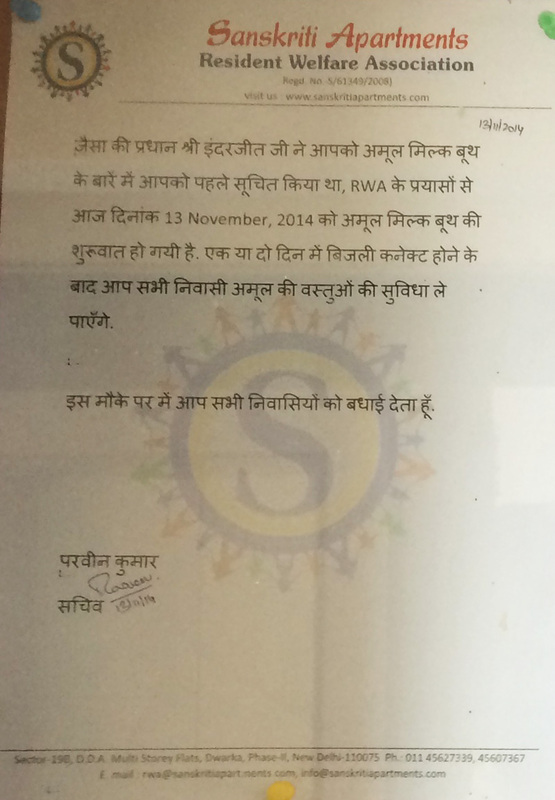 So from now (1st January 2015), RWA authorize Mr Mahesh as the new scrap dealer for Sanskriti Apartments. 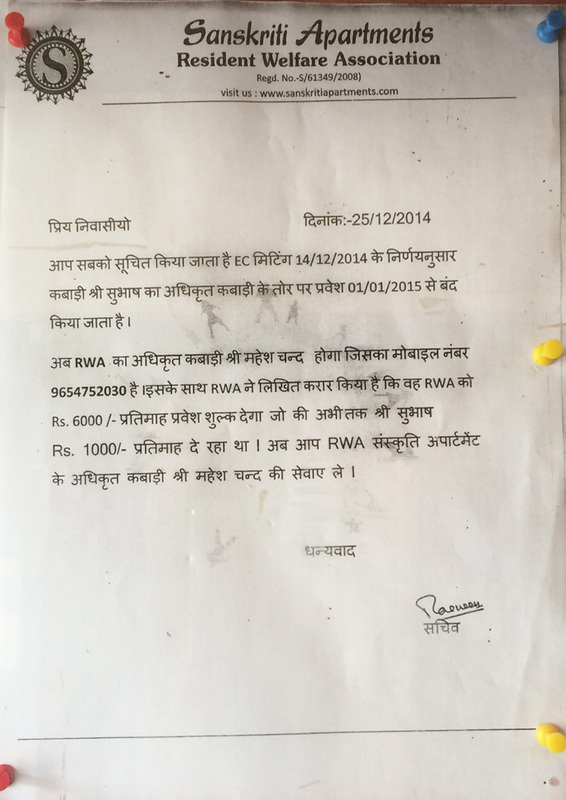 RWA have made a legal contract with him and fixed a fees of Rs. 6000/- per month (Rs. 72000 per annum) in comparison to the previous one which was Rs. 1000/- per month (Rs. 12000/- per annum). Please contact RWA office in case you have questions or leave a comment here. As per notice dated 10/11/2014 ref no. 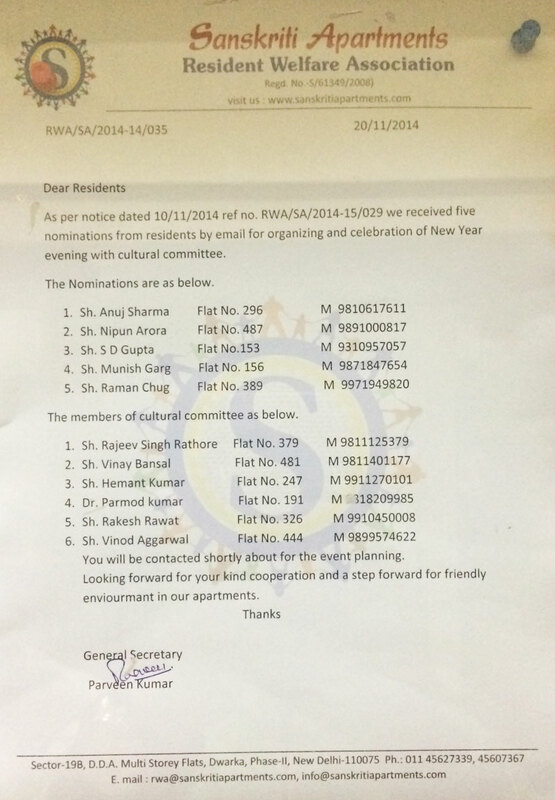 RWA/SA/2014-15/029, we received five nominations from residents by email for organizing and celebration of New Year evening with cultural committee. As all of you know that Amul booth has been started in our society. In a couple of days, the electric connection should be in place for Amul and they should start all the other products from Amul. 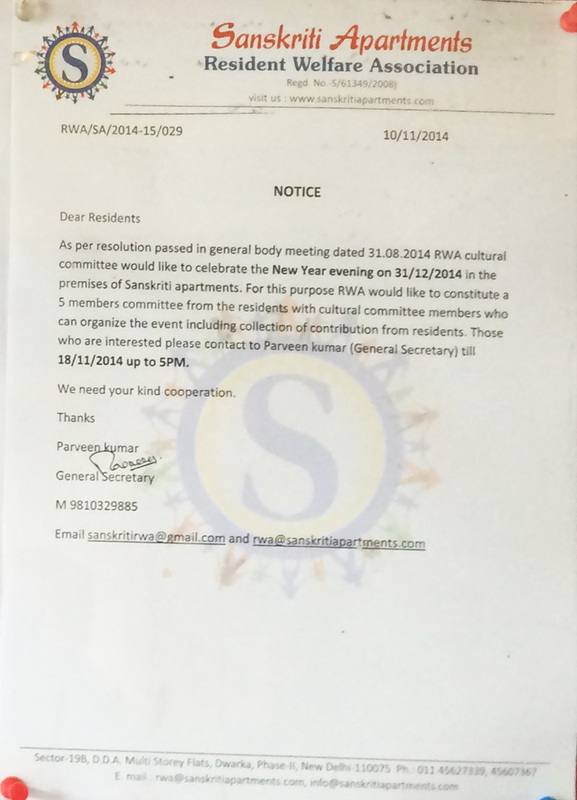 As per resolution passed in the General Body Meeting dated 31/08/2014 RWA ultural committee would like to celebrate the New Year Evening on 31/12/2014 in the premises of Sanskriti Apartments. For this purpose RWA would like to constitute a 5 members committee rom the residents with cultural committee members who can organize the event including collection of contribution from residents. Those who are interested please contact General Secretary Parveen Kumar by 18/11/2014 5PM. The General Body Meeting has been scheduled for 23rd November 2014 at the connecting Bridge. The meeting shall start at 10:00 AM. Copyright © 2018. 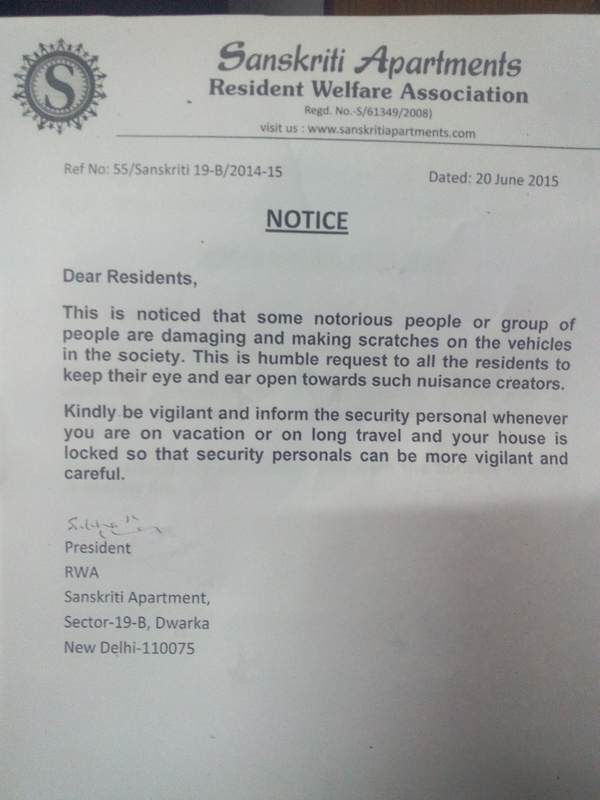 All rights reserved by Resident Welfare Association, Sanskriti Apartments.